a few weeks ago i went a little "bean & legume" crazy at williams sonoma. and if they look pretty, then i know i am in big trouble. it came as quite a surprise to me when he went back for seconds during lunch and enjoyed leftovers that same night for dinner. that boy is full of surprises. 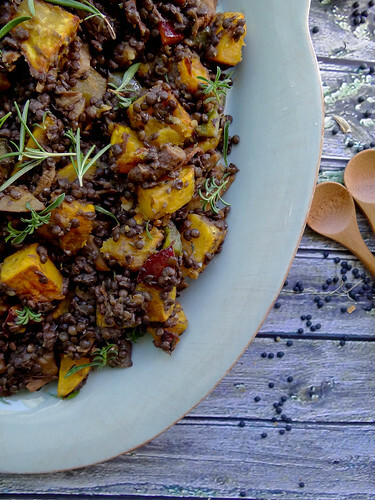 butternut squash is roasted with chocolate peppers (a variation of the sweet bell pepper) at the same time the lentils are cooking. wild mushrooms are rinsed and soaked - saving the mushroom "broth" for later, then sauteed with garlic. local purple plums add a hint of sweetness and color to the final dish - i love the earthy rosemary and winter savory with the delicate sweetness of the plums. hearty enough for a main course & pretty enough for a show stopping side. 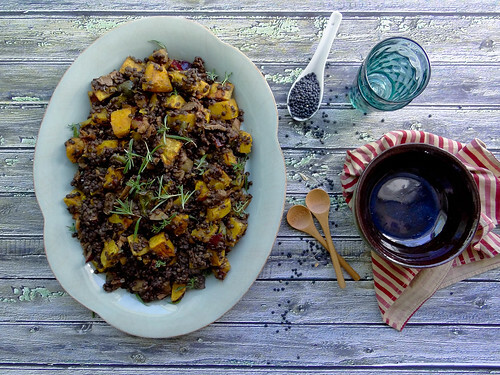 this essentially is the perfect dish for your next holiday or family gathering. this dish was best simply dressed with a bit of good quality olive oil and flaky salt. each component of the dish has such wonderful flavor why cover it up with more flavor than necessary. how do you plan ahead for holiday meals when travelling - do you always bring a dish to share? are your loved ones adventurous eaters and willing to try just about anything? rinse your lentils. in a small sauce pot bring water to a boil, add lentils, cover and simmer for 35 minutes. peel, seed & cube butternut squash. prep your bell pepper - place pepper and butternut squash on a rimmed baking sheet & toss with canola oil & a sprinkle of salt. roast in pre heated oven for 20-25 minutes. 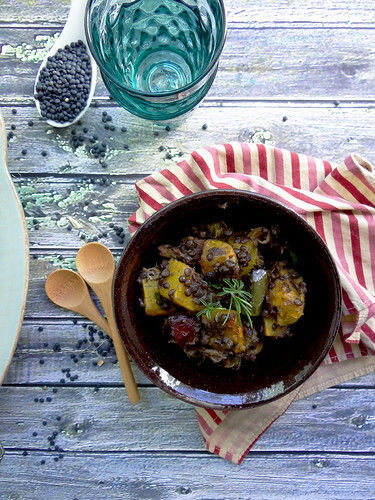 pit and cube plums, place in a large bowl - mince herbs and add to bowl. prep garlic & check on mushrooms. once mushrooms are rehydrated, roughly chop. heat a medium saute pan over medium high heat - add a turn of olive oil and saute mushrooms and garlic 8-10 minutes until mushrooms are golden brown. 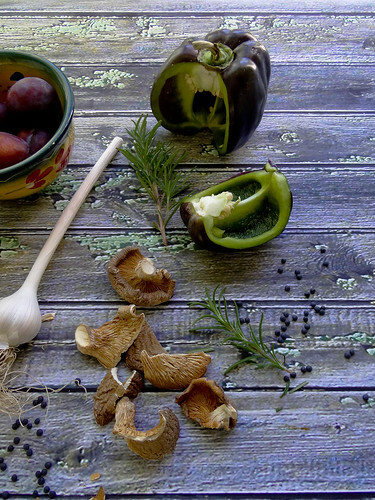 add mushrooms and garlic to the bowl with the herbs & plums. 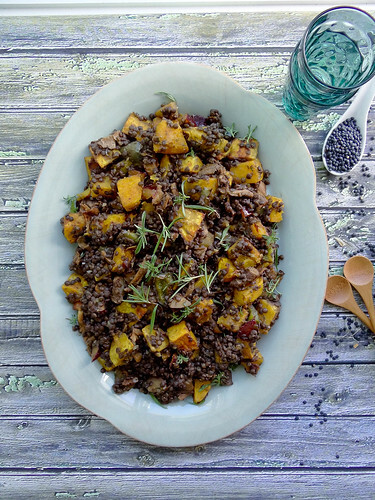 remove butternut squash & peppers from the oven and add to the bowl. 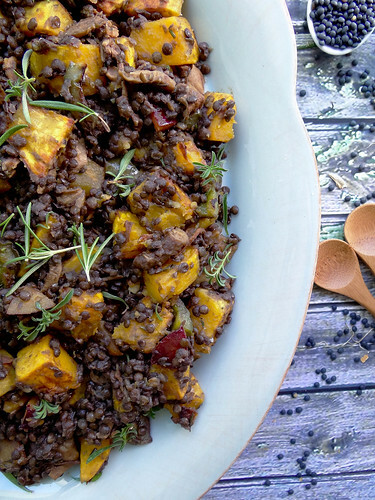 when lentils are done add to the veggie & herb mix - drizzle 1/4 olive oil & maple syrup, toss to coat veggies and lentils. turn onto a serving platter, sprinkle with good flaky salt and a few turns of freshly cracked pepper. garnish with additional fresh rosemary & winter savory. Okay - I was hooked from the start, but when you said there were plums in this dish I got so excited! I can't believe how good it all sounds together. My family is usually pretty adventurous about the things I bring by, though I do sometimes get feedback like "This was very, very well done. I can tell it's amazing. But personally, it's not my thing..." :P Oh well! 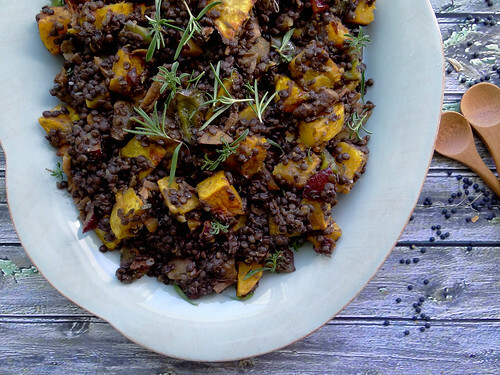 I'm on a squash and lentil kick myself! This looks gorgeous, like it could be used as the centerpiece for a fall feast! You totally ned some chocolate peppers in your life, not only are they yummy but so pretty too! Ooh, this sounds like such a great combination for fall. 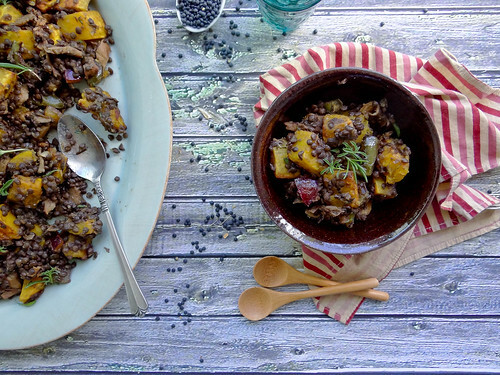 I would never have thought to add plums to a lentil salad! Seriously, I pin everything you make. I'm on the verge of being a pinning stalker. In others news...just wondering, do you think this would lose a lot w/out the peppers? I have serious digestive issues with peppers. Haven't ever had chocolate bell peppers but if they are similar to bell peppers I'm guessing it will be the same problem... usually I just omit peppers from my recipes, but I worry I'm losing a lot of key flavor. Could they be any cuter?!? And of course the recipe you used them in makes them even more amazing! LOVE! 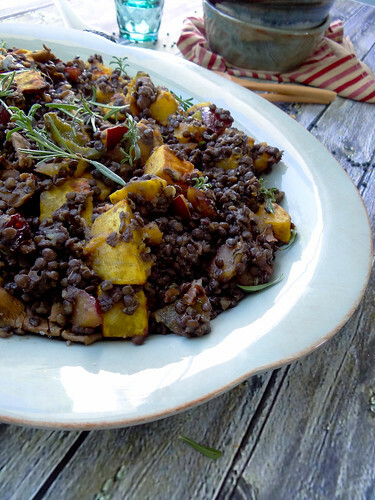 There is not one aspect to this salad that I don't love: butternut squash, beluga lentils, wild mushrooms, plums! Did you make this dish just for me? You are just too kind! ;-) Awesome recipe, Heather. Truly! And there is not one aspect that I don't love about YOU! I absolutely made this dish for you, now only if you lived next door we would be able to enjoy this together! another gorgeous creation! 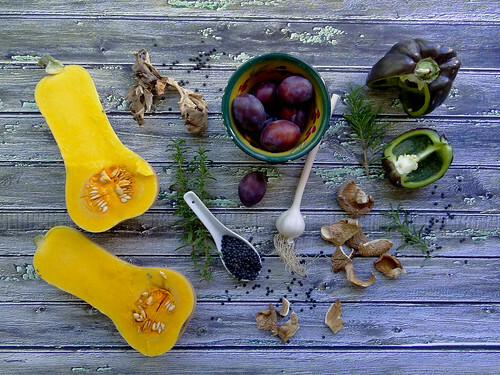 and how cool are the ingredients .. chocolate peppers plums and the gorgeous color from the squash! 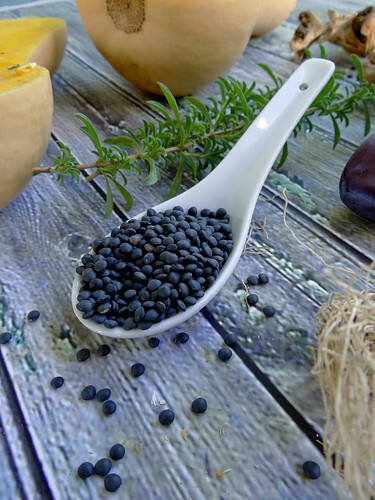 Love beluga lentils! And this gorgeous dish. I loved everything about this dish....except the fact my sister said the leftovers weren't very pretty, so much so she didn't even try it! acorn squash ravioli // thyme garlic "butter"